In the field of organopalladium chemistry there is some debate about the possible existence of unconventional Pd(II)-Pd(IV) cycles in palladium catalyzed reactions in addition to familiar Pd(0)-Pd(II) cycles (see earlier blog on this topic here). The debate is not always obvious: all too often Pd(IV) is presented as nothing unusual like announcing Martians can ride bicycles without explaining first that Martians have finally been found. Likewise the palladium 0-II camp happily ignores anything to do with II-IV or so it seems. New work by Powers & Ritter (DOI) does not exactly settle the debate but introduces a new palladium species , Pd(III) in certain C-H activation reactions. In this reaction benzo(h)quinoline 1 is first reacted with palladium acetate resulting in Pd insertion into the C-H bond and simultaneous Pd coordination to the quinoline nitrogen atom. In the dimer 2 the palladium atoms are connected with two acetate bridging ligands. Addition of an oxidizing reagent such as chlorine or dichloroiodobenzene has the surprising effect of forming 3 with a Pd(III)-Pd(III) chemical bond by oxidative addition. No evidence was found for a Pd(IV) species such as 6. By heating the dimer the chlorinated benzoquinoline 4 is formed in a concerted 1,1-reductive elimination. 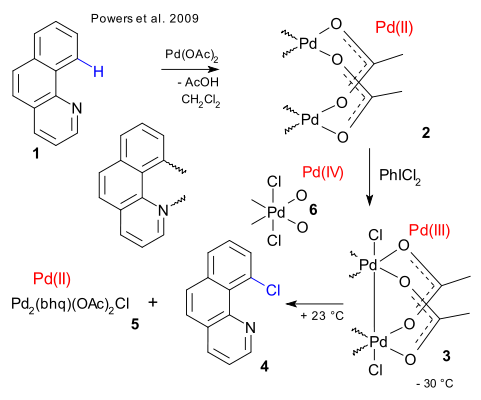 An equal amount of an as yet unknown mixture of Pd(II) compounds (5) is also formed which by adding silver acetate and more of 1, reforms the dimer 3. The palladium dimer also works in catalytic amounts.